The days' break was a group of seven: Tony Martin (OPQS), Tony Gallopin (Lotto), Rein Taaramae (Cofidis), Sammy Dumoulin (AG2R), Simon Clarke (Orica), Matthew Hayman (Orica) and Lieuwe Westra (Astana). The rain was heavy and the roads were incredibly slippy, combined that with all the teams jockeying for positions before the first sector of pavé and that led to countless crashes. With 67 km to go Chris Froome (see above) had crashed heavily (for the second time today) and had to abandon the Tour de France. 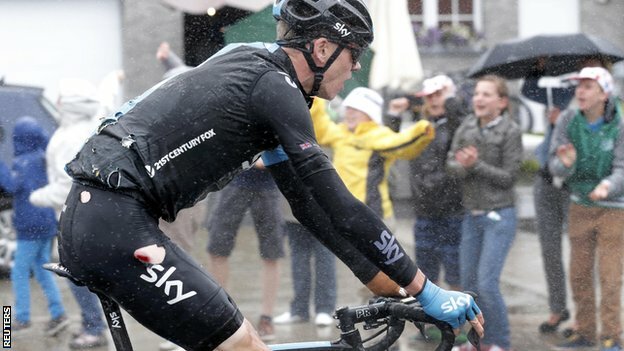 This Tour de France has been a nightmare for Britain, despite starting in it. The first section was the Carrefour de l'Arbre and what was originally section 9 became section 7 as two sections had to be removed for safety reasons; personally I think they should have abandoned the stage as it was unsafe for riding in. The breakaway and peloton made it over the first sector without incident. The breakaway's lead was 1'51" after the first sector of pavé. Tejay Van Garderen and Alejandro Valverde were dropped and were 40 seconds back. Westra took the 20 points at the intermediate sprint in a not too bothered sprint., whilst Sagan won the Peloton sprint. The dropped riders all caught back on after sector 9. Rein Taaramae was dropped from the on the second section of cobblestones. Whilst, the peloton were having more problems as Lars Boom had to cyclocross his way through the mud. Alberto Contador was dropped on the sector 8 and was desperately trying to rejoin the maillot jaune group. The breakaway went over section 6 (Bersee) with a lead of about 40 seconds. 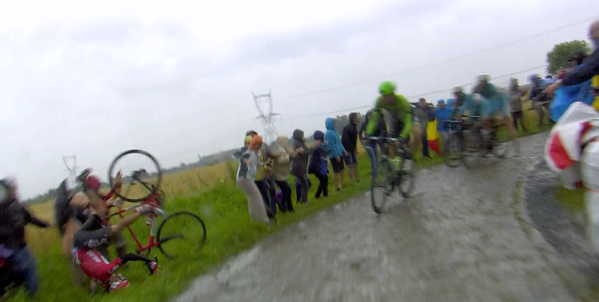 Talansky and Van den Broeck crashed on the first corner of Bersee. Belkin riders, Lars Boom and Sep Vanmarcke used this as an opportunity to attack. At the end of the section Heinrich Hauser had crashed with an Astana rider. By this point, the Contador group was 54'' behind the yellow jersey group. With 30km left, Sammy Dumoulin had crashed and was caught by the Belkin group. Heinrich Hauser had crashed again around a traffic circle. The Four riders of the breakaway was caught by an elite group of about 10 riders including Nibali and the two Belkin riders. As the race entered sector 4, we can see 3 groups on the road, the maillot jaune group, the Talansky group at 45 seconds and the Contador group about 20 secs behind that. All the groups got over sector 3 safely but the Yellow jersey group extended their lead. As the Leaders entered the 3.7km long, sector 2, the Contador/Thomas group had dropped to more than 2 minutes behind the Yellow jersey and Geraint Thomas attacked Contador, with Porte, to take some time back for the two of them. Whilst at the front, three Astana riders (including Nibali) with Boom attacked Sagan and co. Richie Porte and Geraint Thomas were able to bridge the gap to the Talansky group. Lieuwe Westra had sacrificed himself from the front group and left the front group to a group of three. The last section of cobblestones started with 6.7km to go and Lars Boom attacked the Yellow Jersey. Westra was awarded the Combativity award. Porte and Thomas attacked from the Talansky group as well, and Contador caught the group in front of him. At the front, Lars Boom who started the day 16 minutes back, went on to take the victory in one of the best stages in Tour history. Fulsang and Nibali produced a tremendous effort to take 2nd and 3rd place 22 seconds back. Richie Porte was the best of the GC contenders at 2'11'' and Valverde was 20 seconds behind them. Contador lost almost 3 minutes on Nibali.